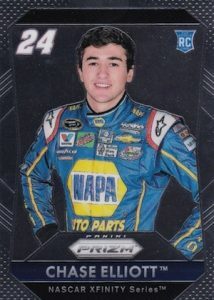 2016 Panini Prizm NASCAR Racing is the official debut product for the Panini NASCAR line. Each hobby box includes one autograph and two memorabilia cards and every pack offers an insert, Prizm parallel or hit. 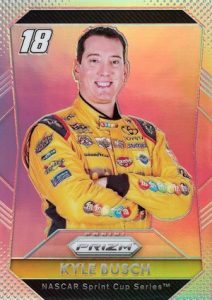 Like most Prizm releases, the chromium 2016 Panini Prizm NASCAR Racing is heavy on parallels. In addition to nine different colorful parallels, with eight limited to 149 or less, SP Variations give collectors additional image choices for racing legends like Darrell Waltrip and Dale Earnhardt Sr. Averaging one per hobby box, 2016 Panini Prizm NASCAR Racing autographs include Driver Signatures and Patented Penmanship. Both also feature multiple parallels of varying rarity. Outside of the box guarantees, each hobby case promises an autograph from Dale Earnhardt Jr., Kevin Harvick, Jimmie Johnson or Danica Patrick. 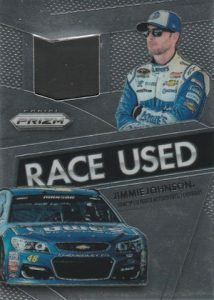 2016 Panini Prizm NASCAR Racing relics include multiple race-used memorabilia pieces and average two per box. 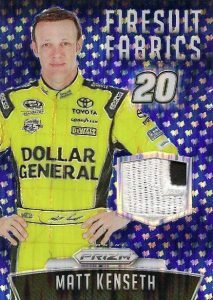 Among the options, Race Used Tire and Firesuit Fabrics also come as Checkered Flag Prizm parallels. Basic inserts include Winner's Circle (1:12 packs), which showcases the 2015 race winners, and Competitors (1:12 packs). Prizm parallels for Winner's Circle and Competitors fall in each box. Other inserts include Blowing Smoke and Raising the Flag. 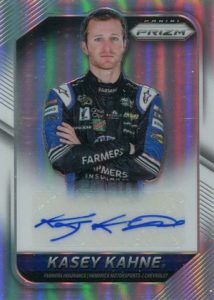 KURT BUSCH 2016 PANINI PRIZM CERTIFIED AUTOGRAPH AUTO ONLY 50 MADE L@@K!!!!!!!!! PARALLEL CARDS: Prizm, Red/White/Blue Prizm (Fat Pack), Green Flag Prizm #/149, Blue Flag Prizm #/99, Camo Prizm #/95 or less, Red Flag Prizm #/75, Rainbow Prizm #/24, Gold Prizm #/10, White Flag Prizm #/5, Black Prizm #/3, Checkered Flag Prizm 1/1. PARALLEL CARDS: Prizm, Gold Prizm #/10, Checkered Flag Prizm 1/1. PARALLEL CARDS: Red/White/Blue Prizm #/99 or less (Fat Pack), Green Flag Prizm #/99 or less, Camo Prizm #/93 or less, Blue Flag Prizm #/75 or less, Red Flag Prizm #/50 or less, Rainbow Prizm #/24, Gold Prizm #/10, White Flag Prizm #/5, Black Prizm #/3, Checkered Flag Prizm 1/1. PARALLEL CARDS: Prizm, Gold Prizm #/10, Checkered Flag 1/1. PARALLEL CARDS: Green Flag Prizm #/99 or less, Blue Flag Prizm #/75 or less (No card #13), Red Flag Prizm #/25 or #/5 (Card #1 - #/10), Checkered Flag Prizm 1/1. PARALLEL CARDS: Blue Flag Prizm #/99 or less, Green Flag Prizm #/99 or less, Red Flag Prizm #/25 or less, Checkered Flag Prizm 1/1. PARALLEL CARDS: Camo Prizm #/94 or less, Green Flag Prizm #/75 or less, Blue Flag Prizm #/50 or less, Red/White/Blue Prizm #/25 or less (Fat Pack), Red Flag Prizm #/25 or #/15, Rainbow Prizm #/24, Gold Prizm #/10, White Flag Prizm #/5, Black Prizm #/3, Checkered Flag Prizm 1/1. PARALLEL CARDS: Green Flag Prizm #/99, Blue Flag Prizm #/49, Red Flag Prizm #/25, Checkered Flag Prizm 1/1 (No card #9). PARALLEL CARDS: Green Flag Prizm #/149, Blue Flag Prizm #/75, Red Flag Prizm #/10, Checkered Flag Prizm 1/1. Not all subjects found in parallels. View specific options with the full spreadsheet. Aden Taylor � The normal Panini pattern for checklists is anywhere from one week before release to the day of release. Aden Taylor � At this point, everything we know is noted on the profile. Sprint Cup is all I have seen. Aden Taylor � Release dates change regularly with no explanation. Shouldn’t #33 for Winner’s Circle be Jeff Gordon? Aden Taylor � This is the exact checklist provided by Panini. If there is an error in the listing, we won’t be sure until the cards come out. It actually is Jeff Gordon for Winner’s Circle for #33. Martinsville was the 33rd race and Jeff Gordon won it. Blasters might be and I’d assume pretty soon. Really really digging this set thus far. $69 is a decent price for it as well. Love all the variations too. I think this is honestly one of the most unique NASCAR sets ever.. Gonna try to complete the master set of my favorite driver because I love the look of these cards so much.. I recently bought a blaster box and puller a 1of 1 clint bowyer black and white checkered auto. I cant find any info on the odds of 1 of 1 in the retail blaster box. Do you know where I can find any info? So far, I’ve purchased two blaster boxes and 1 Hobby Box. The two blaster boxes were decent. I like that they guarantee a hit, even if that means there’s not going to be a lot of future value for the items, but I don’t collect for that. I got the hobby box off of ebay for a bit cheaper than others, so I figured why not. Nothing extremely rare or fantastic, but pulled a Kyle Busch parallel /99, Rusty Wallace Parallel /149, Erik Jones /99, a Paul Menard Firesuit Fabrics /99, Kurt Busch NN Race Used Tire, and a Brian Scott autograph. While I’d prefer a higher count of cards for what it costs, I love the look of the cards. 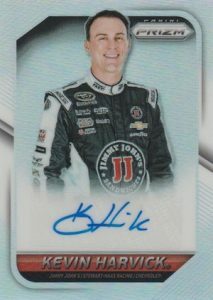 I primarily buy cards anymore to send off to players/drivers to sign, so it’s nice to have some good looking cards for more modern drivers like Matt Kenseth and Kurt Busch where it’s not overtly expensive. All in all I like the product itself. Just hoping next year Panini makes a more low-end option to go along with all of this other stuff. Jay Stadt � Just to clarify, the guaranteed autograph for Dale Earnhardt Jr., Kevin Harvick, Jimmie Johnson or Danica Patrick was for each case (12 hobby boxes). However, you should have pulled three autographs or relics in total from a Hobby box. I really like this set of prizm. The price is really fair for what you’re getting; especially in comparison to the prizm prices for other sports. I also like how the checklist is spread out and not one sided to a particular driver, unlike in other sports how 1 team could be doing way better than all the other teams, thus adding more value to any player of that team’s autos/GU/#d/etc. This has more vet autographs/GUs than any other prizm I’ve come across, and the market for such hits is pretty spread out as well. For the money, I think this product is totally worth it. The cards are nice, both hobby and retail are viable options. I really hope panini keeps the lay out this way and doesn’t over saturate the product with less skilled drivers (no-name vets) or ‘meh’ rookies. They are the best cards I’ve ever seen!! 2016 Panini Prizm Nascar Hobby Racing Box Danica Patrick Joey Logano AUTOS ? ?